Tracheostomy Collar. 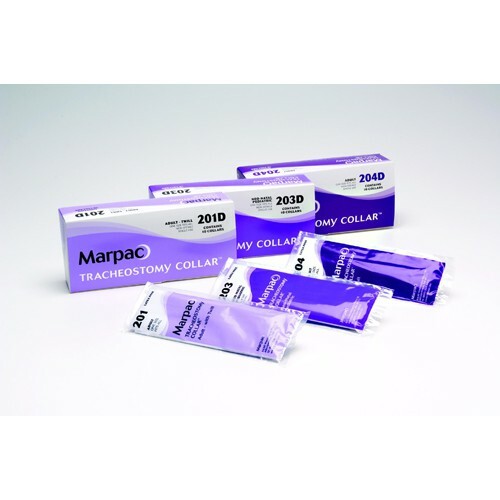 BUY Marpac Trach Collar 201D, 203D, 204D..
Marpac Tracheostomy Trach Collar with Velcro Adjustment is a tracheostomy collar that secures tracheostomy tubes comfortably and easily. This tracheostomy collar is designed with Velcro straps that facilitate an easy adjustment of collar according to the patient size while ensuring a completely secure fit for tracheostomy tubes. Marpac Tracheostomy Trach Collar with Velcro Adjustment is a sterile product and is available in several different sizes to fit patients of different ages and shapes. If you're searching for a comfortable, easy-to-use trach tube that is simultaneously secure and sturdy, look no further than this convenient, hassle-free trach tube. You might also be interested in similar tracheostomy collar products that we carry, such as Trach Drain Sponge by Kendall Excilon. Secures trach tubes easily and comfortably. Velcro strips allows for adjustment of the collar according to patient size while ensuring a secure fit. Available in a variety of different sizes. My Marpac tracheostomy collars are by far the best fitting and most comfortable collars I have worn. I have been using the "Marpac Tracheostomy Trach Collar with Velcro Adjustment" over 10 years now. I am completely satisfied with this product. The collars are soft yet durable. The collars keep the Trach Tube secure without the sensation of being strangled. I will continue using these collars for many more years. I am wearing this collar for 3 months and it very comfortable, easy to use product. A key feature of this product is that reduce accidental decannulation by limiting the movement of the tracheostomy tube. 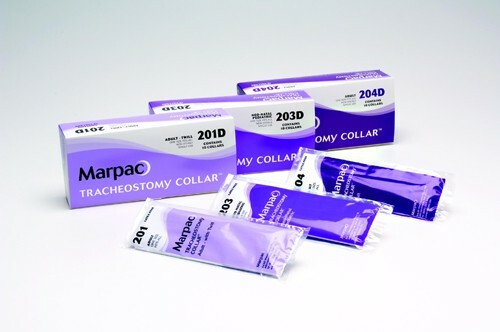 Marpac is the best brand that provides tracheostomy collars. It is available in one size, however it fits to everybody. MY 12 year old son has been using tracheostomy device because he can't breathe normally. He has an obstructed airway and we still don't know when it will be cured or if it will be cured at all. I'm just happy that this technology is already available. Marpac's tracheostomy collar is of excellent quality, thanks to the makers!